As the intersection of news and social media is merging at a faster rate, there are various questions that come up with the use of the Internet as a tool for informing the masses. How does the monetization of news websites and “click money” affect the quality of reporting? How does the Political Correctness culture — mixed in with multiculturalism — affect the honest issues that people need to talk about? 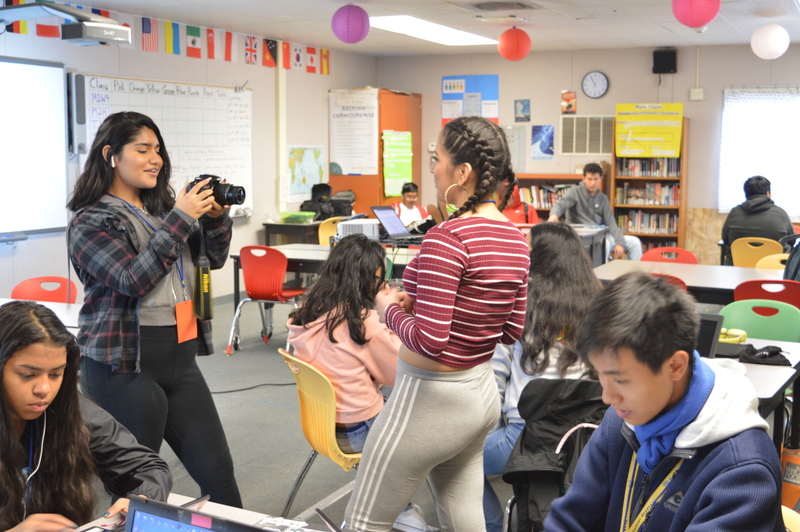 Two teachers at Summit Preparatory Charter High School in Redwood City gave their perspectives on how the journalism industry is affected by the internet and by the new political and social movements that have occurred within the last couple of years. Chris Kelly is the eleventh grade AP U.S. History teacher at Summit Prep. David Tellez is also a history teacher, but he instructs students in Modern World 1 and 2. Both of them have had experience working in the journalism industry, with Mr. Kelly working for various publications, most notably as an editor on The Dolphin Log, a quarterly publication on the history and culture of the San Francisco Bay, from 1993 to 2005. Mr. Tellez was a part of Univision as an intern for Community Communications in Los Angeles before becoming a teacher. With both of them having experience in the journalism world and as history teachers, they have the ability to analyze the historic and local impact of news and how it affects the lives of people. One of the things that greatly influenced the rise of interest in the news is the terrorist attacks that occurred during 9/11. During that time, Mr. Tellez himself was in high school, and he said that the way that he and his classmates were often informed was through the lens of satire. He remembers watching The Daily Show with Jon Stewart and being informed through him. But then the question comes up about how people should deal with PC (political correctness) culture. It’s a rather hot topic in general, with both sides having solid arguments as to the definition and the implications that can come with implementing these “social norms”. Both teachers agreed that PC culture can be used as a positive tool to allow for communities to further understand people, but at what cost? Both of them agree that the use of people that need to have their voice heard is high, but there should be a point where people should also be respectful of the questions that come as a result. Mr. Tellez gives an example with his mentor group having questions about theology, culture and race in the group. For instance, if someone posed the question about the differences between Hispanic, Latino, and Chicano, they would not be able to ask this question under the norms of political correctness. Mr. Tellez also adds that when a person is offended, they need to fully talk it out. Otherwise, their grievances will not be fully addressed, which makes a more divided community. Edward Murrow is an iconic news reporter from the beginning of World War II who was known for putting his life in danger for finding the truth. was famous for his reports during the McCarthy scandal in the mid 50’s. With the reporting and the investigation that Mr. Murrow did, he was able to clear the name of Mr. Radulovich through his television show See It Now on CBS. I have been watching him since 2013-14, and I constantly go to his news analysis and commentary because of how honest and factual he is. The intersection between honest reporting and wanting to make profit from advertisement revenue is a rather wide gap and sometimes, content creators can be (for a lack of another word) singled out due to the content that they have created. This mostly means that they would be blacklisted on many advertisers. With Mr. DeFranco, it was due to the controversial videos that he makes; for instance, in this video he informs the audience about the protests against Milo Yianoppolus and Martin Shrkeli’s speech at the University of California-Davis. Mr. DeFranco puts forth the argument that those against Yianoppolus and Shkreli should not be quick to shut down their voices, even if the speakers’ ideas are against what the protesters believe in. Such arguments about free speech are a rather touchy subject to talk about during our political moment. Mr. DeFranco’s argument also ties back to what Mr. Tellez and Mr. Kelly said in regards to PC culture and the negative effects that can have in creating a dialogue. Philip DeFranco is able to step out of the boundaries of both sensationalism and political correctness to bring about news reporting in a clear and honest way. This makes him “not advertiser-friendly.” In August 2016, YouTube made public that if there was any content that was deemed “not advertiser friendly” (one of the categories was any talk about political conflicts, natural disasters, tragedies and war even if the images are not shown), it would be demonetized. This means that people who use YouTube as their main income source will basically be censored if they talk about the political, social and economic issues occurring within the world due to their inability to get money from the advertisements that run on their videos. YouTube has the legal right to do this (since they are a private company), but it’s more of an ethical issue. By demonetizing the new generation of news analysis and commentators, then their opinions and voices will not be heard. The scary part is that this announcement is not anything new. According to Ethan and Hila Klein of the popular h3h3Productions channel, they have been having this problem at least two years before due to the tags that they used. At this point, it’s just whether journalism and journalists will be able to coincide with the advertisement driven companies and (to a greater extent) us, the people as consumers of media? In order for the truth to come out and the people involved to make a living, there needs to be some sort of way that they can get money. The one possible way that this can happen is through the purchase of subscriptions to news sites. Otherwise, there would be advertisements on every web page and that can easily be remedied using ad-block. As John Oliver said in his observation of the journalism world on Last Week Tonight with John Oliver, there is a balance that needs to be obtained with the consumer and the producer. Otherwise, the truth will be buried under clickbait. Facebook has started testing paywalls for news on their websites. I’ve been thinking about this (I wrote something about it on my blog a while back). I’m wondering if more users will begin paying Facebook and other social network/content sites to deliver information from paid sources, rather than paying the sources. Well, I don’t think that it would make much sense for people to pay social media sites for subscriptions to news sites and articles. There is convenience with paying a social media platform for once a month for access to reputable news organizations for news, but how many media companies are willing to participate in this program? If it’s only a few sources, it would not be beneficial to customers to subscribe to the option. For social media companies like Facebook and Twitter, the best option would be to essentially have a similar platform to Amazon’s online bookstore, with access to different publications. It’s definitely something that Facebook and Twitter have to be extremely wary of, especially after the Senate hearing for the Russian meddling that has put a lot of pressure for their companies to be “more responsible” (in the words of Sen. Dianne Feinstein) for the content that they have on the platform. I would totally consider using an ad-free, “premium” subscription news platform that works like Amazon’s bookstore. I’d want to pay no more than $20 a month, and to have that dollar amount be split based on my usage habits. If, for example, I read only New York times articles, then the majority of that dollar amount would go to support the New York Times (kind of like how Spotify pays artists based on the number of plays). Not sure if I’d want to do it through the big tech companies though. Yeah, it seems like an immense amount of hassle that’ll come with this program. My main complaint would be that some companies might still have advertisements on the website even though a customer has paid for the “no ads” portion of the subscription. Another thing is that if a person did pay 20$ (using your example), then how much of that 20$ is actually going to the New York Times? But even then, for non-premium sources like CNN or Fox, how much would they get for restricting ads on their platform? Tracking the amount of money that flows from the social media to the people that are subscribing will be interesting to see, as it will probably influence the overall market of subscription-based services.